These are dark times for all those experiencing the rising waters on the Texas coast and in the Houston area. Many IAM members live and work in this area, please know you are all in our hearts and minds. We pray that everyone stays safe, and free from harm’s way. The IAM has trained Employee Assistance Program representatives on the ground, providing assistance. For those being affected by the storm, you are not alone, the Machinists Union family is here for you in any and every way we can help. The horrific flooding isn’t going to recede any time soon as this is a prolonged event with some areas receiving more than 50 inches of rain. Many of the surrounding areas and states may soon see flooding as well. 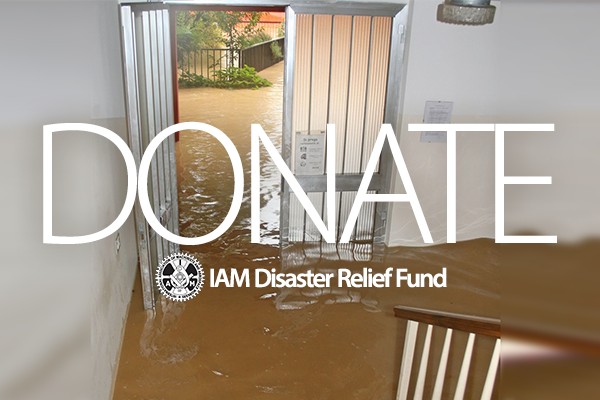 If you are wanting to help but not sure how, I would ask you please consider donating to the IAM Disaster Relief Fund. This fund quickly delivers financial assistance to members who endure hardships due to natural disasters before most resources are able to respond. I’m a native Texan. This is near and dear to my heart. The Machinists Union will lend every resource available to our members affected by Hurricane Harvey and the flooding that has followed.